BitMEX is really fast and easy to use, and unlike CryptoFacilities, they don't require any documentation for verification: just deposit and start trading up to 100x, which makes it even better for speculation purposes. So start by getting an account here. Using this link you will get a 10% discount on trading fees for 6 months at BitMEX. There's just one catch: for US residents, thanks to the CFTC witchhunt, will not be able to get a deposit address as they verify that customers are non-US with geo-location IP lookup. So if you're in the US, you'll have to drop your citizenship or move away, wait for the US regulations to change their tune, or wait for BitMEX policy to change. However if you are already non-US person and you go to the US for vacation it's no problem, the verification occurs on signup. Once you have deposited, your money will be ready within an hour or so, and you can get started trading. 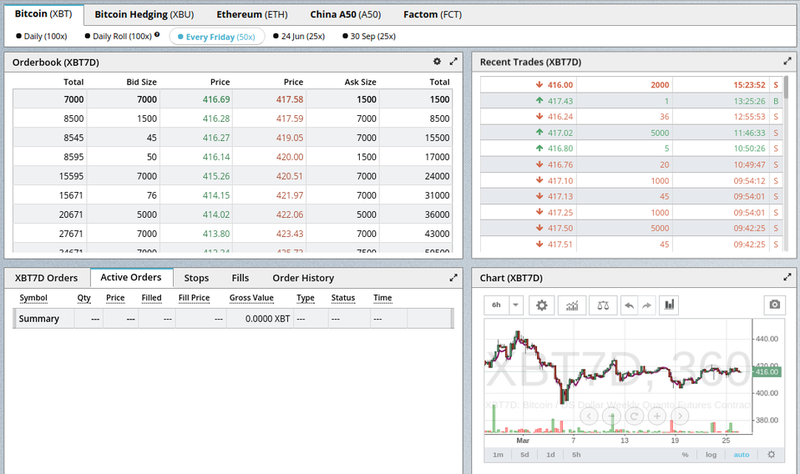 There's a few different kinds of contract "types" you can currently (March 2016) choose from XBT (quanto), XBU (inverse) , ETH (etherium), A50 (China Stock Index), FCT (Factom) and they used to also have XLT (Litecoin) but it was discontinued. Once you've figured out which contract you want to trade you're ready to start. Like any other futures, you can "create" a contract by placing a limit order that doesn't hit the best bid or offer and waiting to have someone else fill it. Like CryptoFacilities, you may NOT hold a long and short position at the same time. So if you buy 1000 contracts, you get out by selling 1000 contracts. And if you sell 1000 contracts to go short and you have a -1000 position, just buy the 1000 contracts to zero out your exposure. The point of futures is to balance risk exposure, and by buying or selling contracts you will be +X or -X contracts. OKCoin is unique in letting people have an open and short position at the same time. Mathematically it does not actually make any sense. If you are not used to this then you will easily become accustomed to how it works. All you're doing is setting margin aside to go short on the contract, which must have a Long and Short customer on either side. If this confuses you, see our Bitcoin Futures Guide to catch up on things. On the left you can see the whole order panel. Market - places your order as deep into the book that it needs to go to get filled. Stop Limit - This is a trigger order. You enter "Limit Price" and "Stop Price". The stop price is the price at which the mark price will reach and then trigger the limit order at the price you specify in "Limit Price". When you select "Set Buy Stop" it will then trigger the limit order to buy when the mark price moves up and hits the Stop Price specified. The opposite happens for "Set Sell Stop". Stop Market - This is the same as Stop Limit, but instead of entering a "Limit Price" your "Buy Stop" or "Sell Stop" gets filled as a Market order. The second box is the Quantity. It's the number of Contracts you wish to place an order for. Each contract type has a different specification for what 1 contract is worth. You can find this value at the bottom of the panel in "Contract Details" and it will, for example, say "0.00001 XBT per 1 USD (Currently 0.0042 XBT per contract)". The Limit Price is self explanatory, it is the price that your order will be executed at, if it will be filled in the orderbook then it will get filled on entry. If it doens't get filled then your order will be placed into the orderbook and wait to be filled. The Cost part of the order panel shows how much of your wallet balance will be used to make the order. Because when you make an order you need to reserve part of your balance to back the margin required for the placement, it's helpful to know how much you will need for a given set of order parameters. This "Cost" will vary based on the chosen leverage. Also, if you have an existing position, the "Cost" will not show anything if you are going to close out that position. The Order Value shows the nominal value of the contracts selected in BTC. This is the unlevered, unmargined amount that the contract is worth. ​Post Only Order - when this checkbox is checked, it ensures that your order will only be filled as a limit order by somebody else, or it will be cancelled. This will guarantee that you get the MAKER discount fee, which is currently -0.025% to -0.1% depending on which contract you're trading. It's a great way for marketmakers to avoid accidently hitting an existing limit order and paying the taker fee when they intend to. Hidden Order - when this checkbox is checked, it makes your order invisible to other traders in the orderbook. You can partially hide an order as well. This will guarantee that you pay a TAKER fee of 0.075% to 0.15% for the privilege. The leverage slider allows you to customize how the selected contract's margin on the position will be treated. This affects all open positions and order in the contract and you can also select "Cross" which uses the whole wallet balance available to back your position in the contract. You may select different leverages with this slider for different contracts, and you never have to worry that you will be pushed into liquidation as the system will reject it. Indicative Settlement Price - This is the price that if the contract was settled immediately, aka spot price. Mark Price - This is what your PNL is computed using, and what also your liquidation is based on. So once the mark price hits the liquidation price on your position, this triggers it. So once you have an open position, you will be liquidated when the "Fair price" crosses your liquidation threshold. That means that nobody can manipulate the orderbook and push you into a margin call -- only the actual underlying spot market can do that, and it's based on their own index. There is still a "fair basis" added to the underlying index, that is usually higher for longer horizons unless the market is in backwardization. This is manually adjusted by the BitMEX owners to reflect market sentiment. So that's how you get started on BitMEX. Pretty easy to get your account going. Remember you can always use the DEMO version of their platform at the Testnet. But you may as well just trade with really small amounts with real money -- 1 contract represents only a few thousand satoshi, a tiny amount -- when it's that insignificant you may as well just do it. If 100x or 50x is too much, you can easily adjust the leverage in isolation so as low as you want. It is easy to get confused by what the contracts represent when it represents bitcoin amounts and you're thinking in USD, so just practice practice practice!